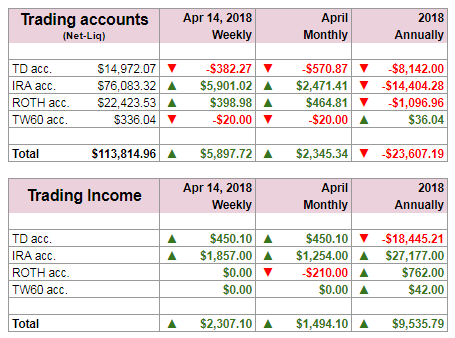 The second week of April was better and provided a good recovery from the lows. We brought in a nice income offsetting previous week loss. Our net liquidation value is still down due to open trades consuming it, although it recovered somewhat this week. However, Trump’s administration keeps disrupting the markets and eventually the entire US economy. China and Europe is slowing down, the US economy too shows a slow down and the earnings season seems to started as not expected – some say badly. What impact is this going to have to the markets next week? It is hard to say how investors would react to the late Friday news of the US bombing Syria. Was this news already priced in? Will the late comers panic and start selling everything on Monday? Hard to say. 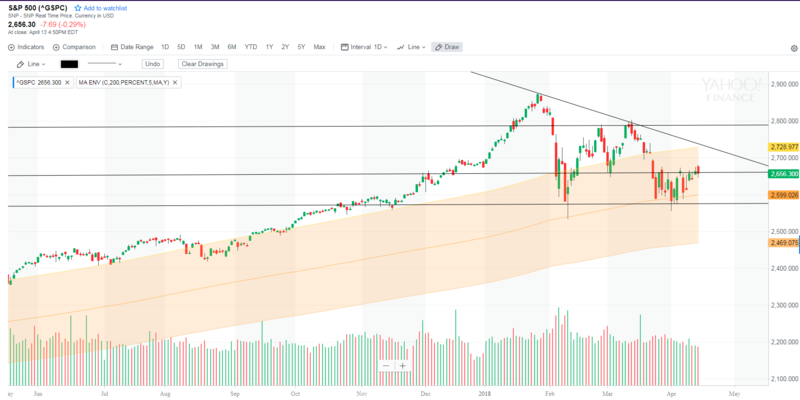 S&P 500 futures will help to tell us on Monday morning (and actually already on Sunday when the futures market opens) what to expect. If futures will be significantly down we will most likely open down and keep selling. We may also see the markets already shrugging off the news and keep on a slow recovery from the selloff. It is difficult to say and predict. Overall, I still believe we are in a medium term bullish trend but the outcome is not clear. The market shows many possible way it may go. There are many resistances on the way up and they may prove to be strong. Given that the market participants are scared of everything, Trump’s escapades won’t help either. The spooked investors would find anything to be a great excuse to get rid of the stocks and pour away a bath water with a baby if needed be. If you are a long term investor, then do nothing. Or be buying>/span> if you have free cash. I do the same. As much as I can, I keep buying high quality dividend growth stocks – dividend aristocrats. Do not sell your existing positions. This period or even if more selling comes, will be over one day and the markets will recover. Warren Buffett clearly says, that over time, stocks go up. If you are investing for the next 20 years or more, use these times of panic as a buy opportunity. Buy, stay invested, and wait. 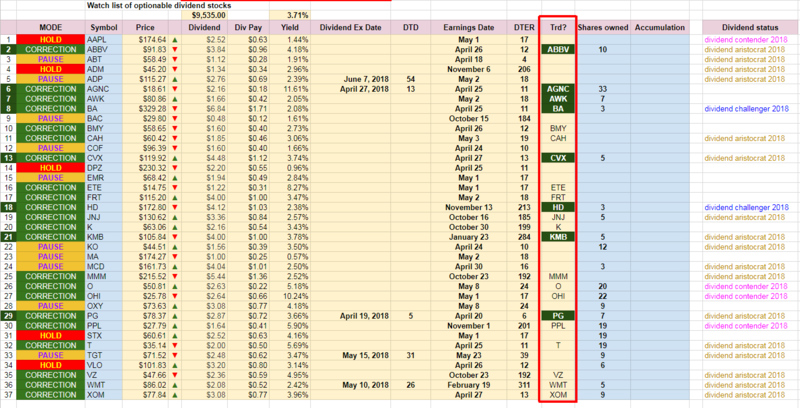 If you are a trader, like me, selling options against equities or indexes, these times are definitely difficult if you have a few bullish trades. I have many bull put spreads open and they are giving me a hard time. But I keep them open, and keep them rolling. Do not close trades at a loss and do not open new trades, only manage the existing ones (which I admit broke this rule last wee). But this time will be over one day and the markets will go up and these trades will recover perfectly. So what if you are stuck in a bull put spread which is in the money or deep in the money? I keep rolling those puts and use call spreads to offset the cost of rolling the puts. Sometimes, however, it results in a debit trade anyway. 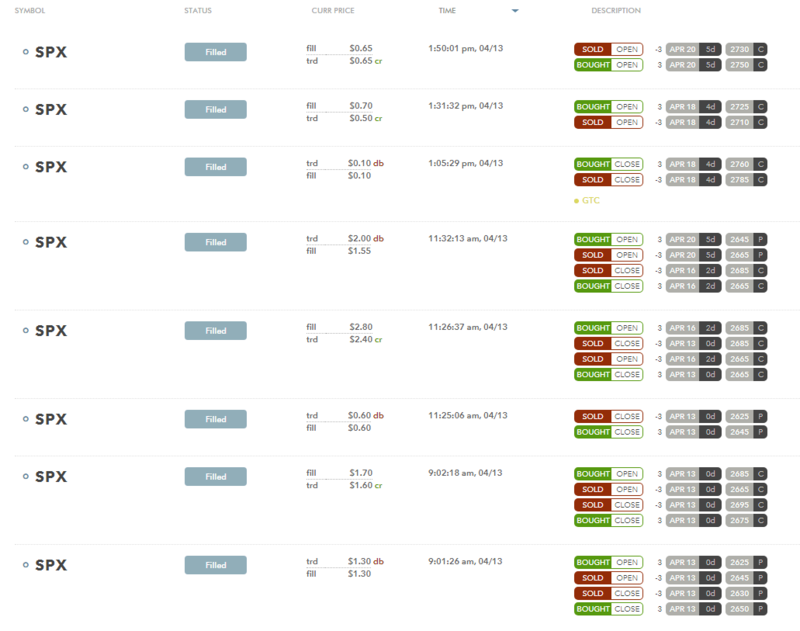 Thus I try to open other trades to collect more credit which I can use to offset bad trades. So far, I collected over $25,000 in credits in the first four months of 2018. I have enough cushion to use those credits to manage other trades. That’s also why I keep track of daily trades and the credit/debit balance. As long as this balance is positive, meaning I have collected more credits than debits, I know that at the end all those trades will be OK. Volatile market is making our net liquidation value (market value) of our accounts like a drunkard moving in a zig-zag way. Last week we were down, this week we are up again and I expect going up as the old trades we have open in our accounts age a bit. Although this still may be a very bumpy road to recovery. I was managing open trades. But it seems, I was too hasty in doing so. If I stayed put and did nothing, I could be better off than now. I got scared of a sudden rally when the market rallied above 2670 and my calls were in danger. So I rolled them into puts. Now, the market dropped, and it may drop even more next week and all those puts are not worse.